Cats have a fascination with cardboard boxes that may seem weird to the average person. 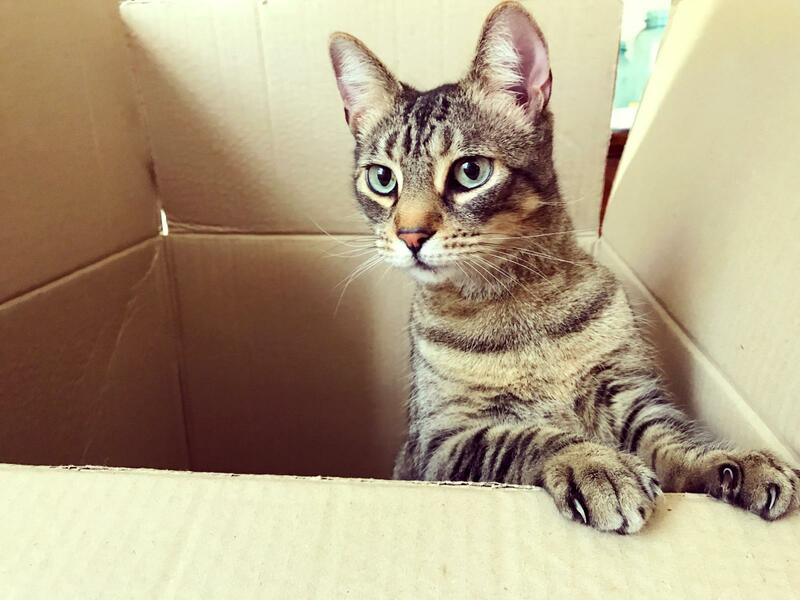 There are actually several interesting scientific reasons why your cat seems to find jumping in and out of boxes so much fun. Cats' love affairs with boxes has a lot to do with their wild cat ancestors. Cats are predators, and their main method of hunting involves lying in wait and jumping out to grab prey quickly. This is why you'll see so many videos on YouTube of cats suddenly popping a paw or their whole body out of a box. This behavior is based on the fact they're hard-wired to hunt prey and practicing this provides them with physical and mental enrichment. Another reason cats like boxes is that hiding behavior is very common among these animals, even ones that aren't shy or frightened. This is also an instinctual hunting behavior as cats prefer to have a safe confined space to stay in while they lie in wait. Sitting in a box allows the cat to be aware of what's going on in the room without feeling "on the spot" by other cats, dogs or people. It also can provide them with a place to nap where they feel secure, just as they would napping up high on a cat tree. Associate Applied Animal Behaviorist and Cat Behavior Consultant Katenna Jones, MS, ACAAB, CCBC agrees, "Cats like boxes because it's a safe spot to rest or observe. There's one way in and one way out, so they can let their guard down a little and relax." In fact, many animal shelters provide boxes in cat cages because research found it lowers their stress levels by giving them a place to hide in an unfamiliar and uncomfortable environment. A study by the National Research Council looked at a cat's thermoneutral zone, which is the average temperature a cat needs to be in to feel warm without making any effort. A cat's normal range is 86 to 97 degrees Fahrenheit, which is about 20 degrees higher than that of a human's. Cats instinctively seek out warm places to feel comfortable, and boxes can provide an insulated spot to collect body heat. Cats need enrichment in their lives to be behaviorally healthy and happy. Aside from the instinctual aspects of boxes, cats also simply enjoy jumping in and out of and exploring them. Since boxes tend to be an item we have around the house, it's natural for a cat to want to inspect its surroundings and explore what a box can do for them. The great thing about boxes is they're a cheap way for a pet owner to provide a fun toy and it doesn't really matter too much if the cat destroys it in the process. Foraging is a behavior that is natural for cats and can stimulate their brains, and it's easy to make a foraging toy with a box, some holes and some cat kibble or treats. If you're not sure if this love of boxes is really an instinctual behavior, just take a look at large wild cats in zoos. A common form of enrichment by zookeepers is providing large-sized cardboard boxes for cats such as lions, tigers, mountains lions and more. This helps alleviate boredom and stress and allows them to engage in behaviors that they would naturally in the wild. Once you understand the reasons behind cats' passionate appreciation for boxes, the behavior seems perfectly natural. It's also a great way to make them happy without much added expense!